Repeal a Ban, or Ban? -Read the excerpt below from the "Best of the Web" post by OpinionJournal.com's editor James Taranto. Incandescent light bulb, used by Americans for over 100 years. “If you are Al Gore and want to spend $10 for a light bulb, more power to you,” Barton said. [Barton] exaggerated the cost of most energy-efficient bulbs and neglected to mention that they last years longer than old incandescent bulbs, which give off about 90 percent of the energy they consume as heat. A Republican campaign to defend America against a sweeping assault on personal freedoms–or energy-saving lightbulbs [CFLs] as they are more commonly known–went down in defeat on Tuesday night. That’s like describing the repeal of Prohibition as a ban on nonalcoholic drinks. NOTE: Under federal law, incandescent bulbs are being phased out in 2012, when American manufacturers no longer will be allowed to make 100-watt bulbs. 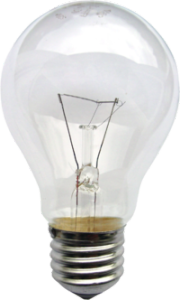 By Jan. 1, 2014, the only incandescents left on the market will be three-way bulbs, plant lights and appliance lamps. Republican congress members attempted in July to repeal this law that would eventually prohibit the sale of incandescent bulbs, so that consumers would have the choice between buying the incandescents or CFLs or LEDs. Consumers have been slow to accept the two emerging alternative technologies, known as CFLs and LEDs. The main complaints: CFLs, or compact fluorescent lights, cast a harsh, greenish beam, unlike the warm, amber glow of incandescents. Also, they contain mercury, a hazardous material which cannot be thrown into the regular garbage. LEDs and CFLs are much more expensive than traditional light bulbs. Neither variety is universally available in dimmer form and, therefore, not always ideal for people partial to mood lighting. In their final months of retail life, incandescents still dominate market share, accounting for about 82 percent of sales. 1. Define ban and repeal. 2. Describe the misrepresentation that Taranto illustrates in the excerpt below. 3. Why do you think the media chooses to “take sides” in the compact fluorescent light bulb debate? 2. Congress passed a law in 2007 (which takes effect in January 2012) banning the sale of traditional incandescent light bulbs. In July, the new Congress (Republicans) attempted to repeal the law (ban). The media portrayed it as an attempt by Republicans to ban energy-saving CFL bulbs, instead of an attempt to give consumers a choice about which bulb they buy.